As this new year begins, we have just released the old year, and allowed it to become the past. This is a time of transition or change, and transitions always contain endings and beginnings, woven together into the eternal cycles of time and life. We tend to prefer to focus on the new thing which has begun to fill our lives, and often prefer to try not to notice the endings, the losses, the release, and yet both are vital for growth and change. These pools at Black Linn in Perthshire, Scotland are ancient sites of divination, where people would come to seek their futures. 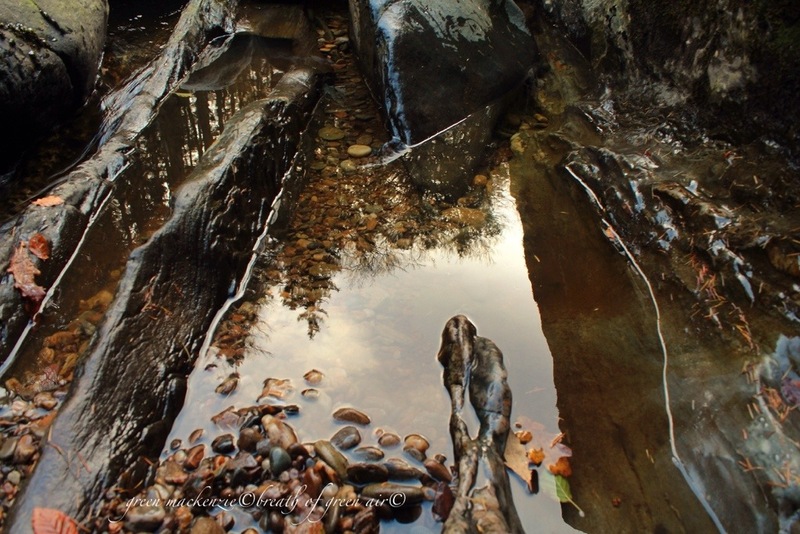 Our ancestors found times of change filled with uncertainty, and hoped that scryers or seers could find clues about the future in the reflections of these sacred waters. We are no different now, but our methods have changed, and we seek to control as much of our lives as possible in order to keep the chaos and uncertainty of change at bay. If we resist the flow of life and it’s inevitable waves of change, we can become frozen like this oak leaf, suspended in lifeless water. Trying to hard to control too much of our lives will do this, and it is usually driven by fear, fear of change. Our lives can become stuck, held frozen in an unproductive winter. We cling tightly to the things we love, crushing the very life out of them, all the while filled with fear at the thought of losing them. Yet for new things to enter our lives we must have trust, trust that the future may contain good things, and in this trust we can release the old. These waters contain layers of the past and the future, and in the magic of the present we can gaze into the reflections looking for patterns and hope. What can you see in the reflecting eye of the pool? The black waters of forgetfulness can work their magic, and move us forwards filled with hope. “In my end is my beginning.” Mary Queen of Scots, embroidered this on her Cloth of Estate while imprisoned in England. So as this new year rolls in, give a moment to remember the old one, and be filled with hope for 2014. Nothing truly ends, it just flows on into a new beginning. see more beginnings at the WP weekly photo challenge. 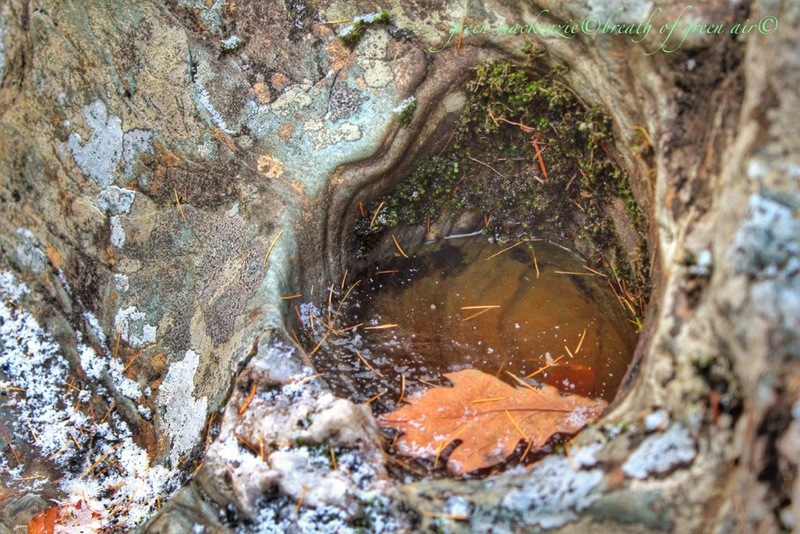 This entry was posted in ancient sites, Celtic, change, elemental, mindfulness, mythology, nature photo, philosophy, photos, spiritual, unconscious, weekly photo challenge and tagged Celtic, divination, nature, philosophy, photography, postaday, scotland, scrying pools, spiritual. Bookmark the permalink. I’m always impressed because of your capacity to turn wise ideas into beautiful words and vice versa. The images of some of the stones look so attractively smooth. …from the scrying pool of your fine mind…. Endings are indeed the seeds of new beginnings – well, often they are. Thank you for this profoundly thoughtful post. Finding the courage to face change is important, yet it is so very human to seek a way to avoid that very task. Blessings on you and yours. Wshing you a great new beginning, Seonaid, and a year filled with good health and joy! Thanks Paula, and the same wishes to you for 2014! I loved this Seonaid . Your words just flowed with me from one beautiful image to another . That’s great to hear Poppy, and I love your own flow of adjectives describing the waters. I trust you saw something hopeful in the waters…..
Reading this gives a certain peace and calm to the reader. I love the circular reference form T.S Elliot to Mary Queen of Scots. Lovely thoughts Wonderful pictures. Beautiful and tranquil setting! 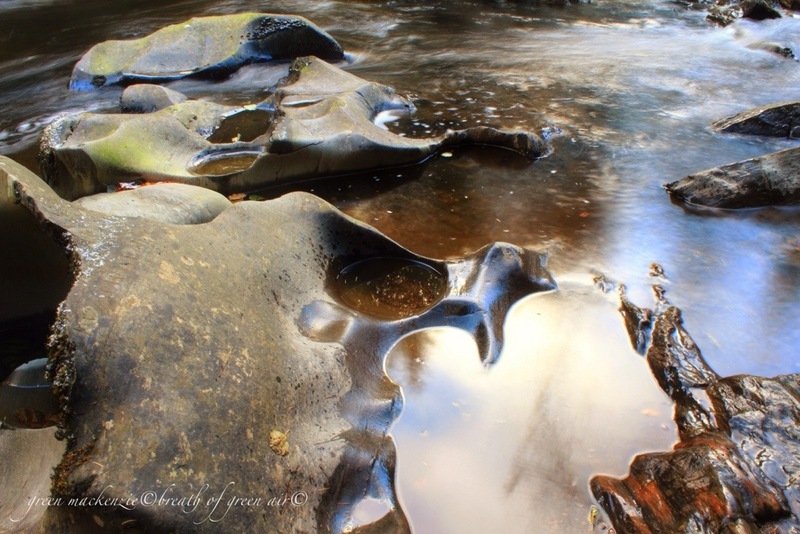 I love the calm of the water in the pools where the stone has been so shaped and polished over the years. Water is truly the beginning of all things! Words of beauty and truth from within. And those photos capture them the way they deserve. I believe this post is one of the most wonderful I have read from you. A worthy beginning of 2014. Anna Christine, what a lovely comment, you’ve made my day. This post has had such a warm response…..hope I can make the next one as good!! Lovely to hear that you enjoy the prose. I was lucky with the light, and delighted how the shots turned out, but it’s always so good to hear this from others. I am slow on responding and those before me have already observed that both the words and images work nicely together. I would add that you have, once again, taken us to a wonderful place in your back yard. I have been feeling that my own little corner of the world has become rather dull. Places like Black Linn remind me of the many, many beautiful places you have taken us. I look forward to many more field trips this coming year. Thanks. I hope I can keep you delighted and entertained over the coming year David. I’m certain that there is beauty where ever we are, nothing is ever truly dull as it will offer something new and unique on each visit on each day….different light and temperatures, different wind and growing conditions..even in the same place nothing is ever repeated! This spot is about an hours drive north of where we live, so not quite our backyard…but not too far outside it 🙂 thanks for your faithful following of my posts over the last year…and for posting the most comments, you are my number one according to my stats box! I love that walk through the Hermitage, it always feels so magical, at any time of year, but that little sprinkle of snow and ice adds something beautiful. Now I must catch up on your delicious posts which I see have been piling up in my reader! Inspiring and moving words, and stunning images. I just kept looking, looking, and looking. I love that! All best to you for a wonderful year ahead! A photo which holds my attention and keeps drawing me back for more is a perfect shot in my opinion…yay! You’ve made my day Lemony! Reflections visual and verbal are all great! Thank you, it was an inspiring place. A slow shutter helped to enhance the difference between the flowing and the still water, it’s wonderful to hear that you looked twice….a sign of a good photo I think! Thanks…because the light was fading fast I needed a long exposure time….making the water look quite beautiful. It’s human nature to wonder what the future will bring isn’t it?Especially in troubled times. There was a crazy period in my life when the first thing I would do each day was to check my horoscope, I was desperate for any glimmer of good I could find. Of course I’ve changed now and am more comfortable with whatever unfolds and so no doubt 2014 will find me exactly where I need to be! I can definitely relate to that Gilly, and of course you’re right that it’s in our nature to want to know, to have some hope, when things are tough. I think this is exactly when we will look for these hints and clues, looking for signs that things might change for the better soon. Hope is a precious commodity in the face of overwhelming darkness. This is a lovely post, altogether, Seonaid, both in the writing and the images. There is some magic in reflections (the word itself has a kind of duality). Strange and beautiful photograph, Seaonaid. Beautiful, especially the first looks like liquid gold! Best wishes for 2014! Liquid gold is a perfect description Ron, thank you. I was about to head back when the setting sun gifted us this beautiful subtle light….I love it when this happens….I might so easily have missed these shots! It was really all about the reflections Ese…..everything else is just a frame to those intriguing waters 🙂 thanks for your lovely thoughts. Brilliant post Seonaid, in every way ! Thank you Kathryn, you’re always so encouraging….loved your shots of the storm from the plane….a little scary perhaps? Not even a little because it was far off in the distance ! Catching the flare was a thrill for me! Thanks Seonaid! Lovely reflections in word and image. What perfect images and words to illustrate beginning. Thank you, I took the photos back in November and had almost forgotten them in all the busy distraction of the holidays! A beautiful, poetic start to the year. Thank you. My pleasure Andrew, lovely to hear you enjoyed it. Thank you, the place itself was so magical that it would have been hard not to capture something wonderful….but the real treat was the surprising golden water which appeared as the sun began to set. These are extraordinary photos even more so with your thoughtful commentary interspersed. 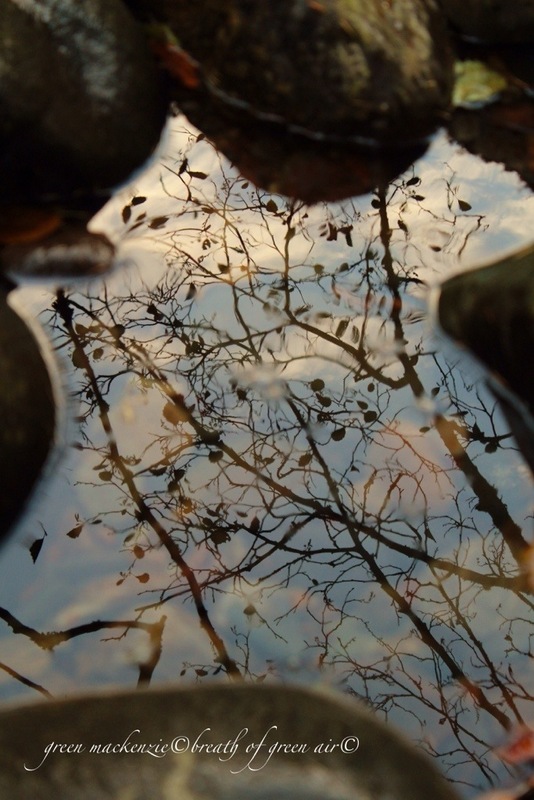 The reflections in the water, the black and copper coloring – a source of divination, like good Tarot Cards (and much more spiritual than Rorschach Cards!). I think this is one of your very best posts, Seonaid. wow – what a start to 2014! Some people refer to these outside events that hold clues for us as “waking dreams.” I like that term myself. Every moment of our lives is a sacred beginning….Gratitude for the powerful and magical photos Seonaid! Delighted that you enjoyed the photos, and that I managed to capture some of the magic of this ancient site. A great post filled with pearls of wisdom. Great images of stuck lives, frozen in pools, you are right but letting go is about the hardest thing any of us has to do in life. I hope you have a great 2014. I’ve enjoyed your posts and look forward to reading more. Thanks Maria, the place itself and the images fuelled the words and thoughts. Places like this feed and nourish creativity, and I can only agree about how hard letting go can be. It sounds so simple and yet it’s a struggle on many levels to have enough trust that more and better and surprising things will flow towards us and into our lives when we can do it. Trust in self, in others and their capabilities, and in the wider world and life are all keys to the process. Gosh that is a beautiful and profound post Seonaid. Those photos are extraordinary. It is like you have captured something of the magic of the place through your camera. Thanks so much for sharing them. Suzanne what a lovely comment. I find this a very captivating spot, infused with a feeling of ancient times, and sound and light bounce around the deep rock ravine in unusual ways, confusing and enchanting the senses. 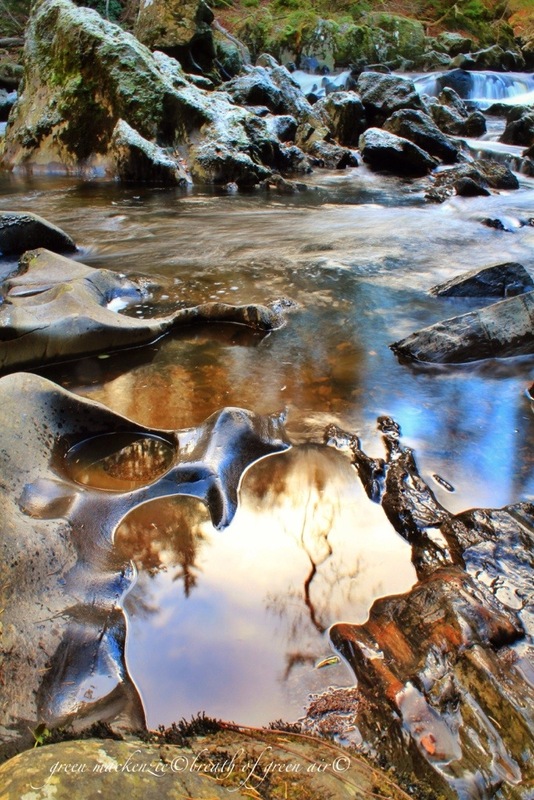 It took these shots as the sun was sinking casting beautiful golden reflections across the pools. I was entranced by the images as I was taking them, so I’m delighted you enjoyed them too. Thank you Christine, I’m delighted that you enjoyed the post so much, and as you say for life to exist there must be flow and change. It isn’t always easy, but we must keep flowing forwards, releasing the past to itself. and that is such a blessing!